Market Order - What Does It Mean? What is a "market order"? 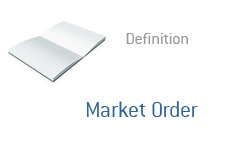 What is the definition of a "market order"? What are the benefits and risks of using market orders? There are two types of orders that you will likely encounter when placing trades through your full-service or discount brokerage - limit and market orders. A market order means that you want to be filled immediately at the best available price. A limit order, on the other hand, means that you want to be filled at or below a certain price (or, if you are selling, at or above a certain price). If you want to immediately buy or sell a stock, then a market order is the best way for you to proceed. Market orders come in handy when you need to purchase or sell a liquid stock (by liquid I mean, plenty of volume). In liquid stocks, you will very likely be filled nearly instantaneously. The danger of market orders? Illiquid and/or quickly moving stocks. Let's say that a stock is flying higher and you want in badly. You enter a market order for 1,000 shares of the stock while it is trading at $7.50. Let's say that the company recently announced a surprising new contract and people are starting to pile into the stock. You log in to your trading account a few minutes later, only to see that you have been filled at $8.45, well above your intended purchase price of $7.50. This type of situation can easily occur in fast-moving stocks, and is probably the biggest danger of using market orders. Another example where a market order may not be your best choice - thanks to a tip from a friend, you decide to buy 1,000 shares of a company that trades on the OTCBB. This stock only trades about 3,000 shares per day, making it very illiquid. Due to the fact that it is so illiquid, you may end up paying more for the stock than you had planned if you decide to use a market order. In this case, a limit order is probably your best choice. To recap - a market order is ideal is you want to purchase or sell shares in a liquid stock as quickly as possible. Did A Stock That You Own Get Halted? What Happens Now? Why Do Stocks Get Halted?